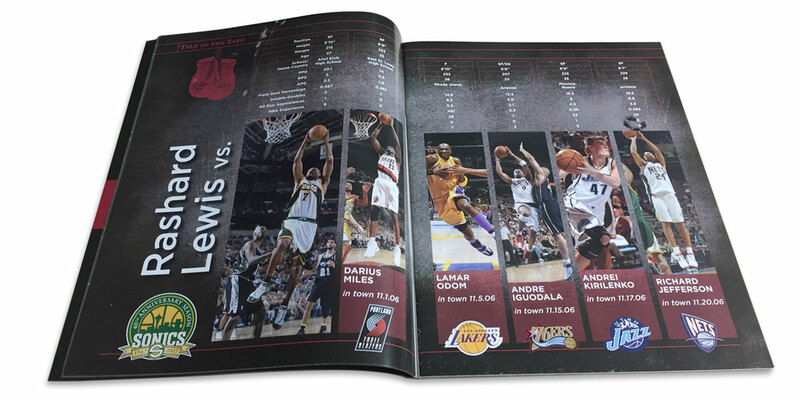 The Basketball Club of Seattle hired me to create a business-changing, game-day magazine. 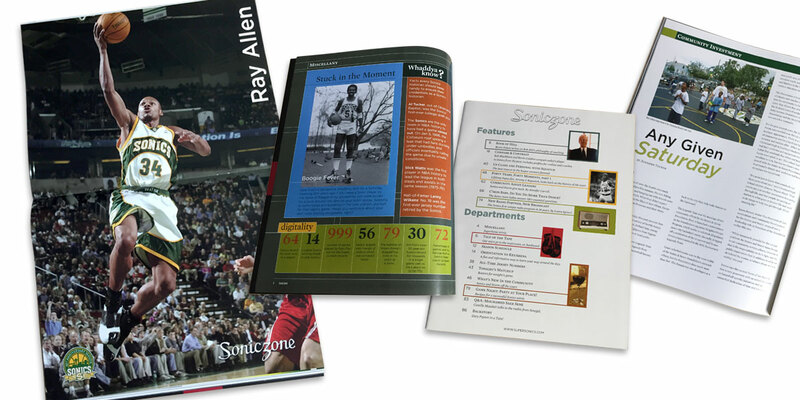 The first of its kind in the NBA, the publication was more lifestyle magazine than game program, and included historical feature articles and player bios and interviews. 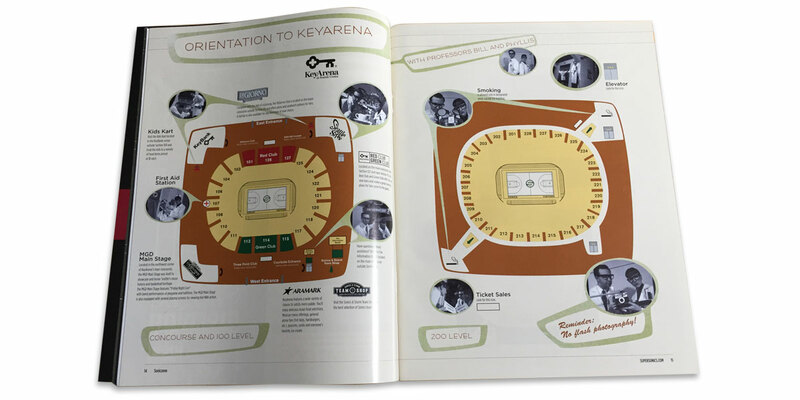 The project was funded by high-end advertising and was placed in business suites and premium seats. How might we publish fresh content for game nights with limited financial and personnel resources? 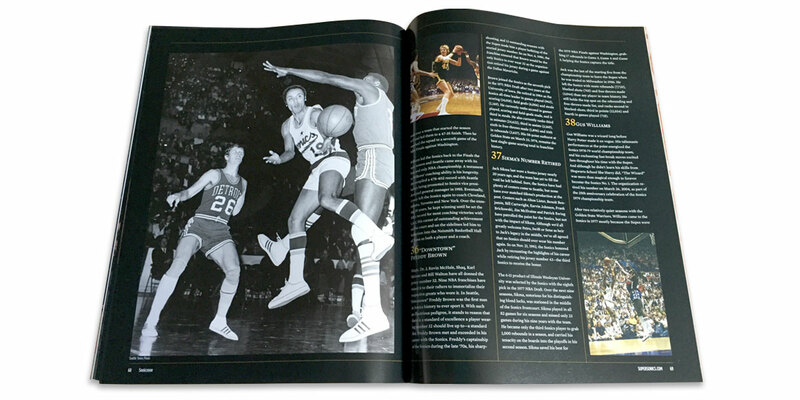 historical feature content that changed half-way through the season, and a black and white insert bound into the middle for every home game. We designed and printed the covers before the season and kept them at the print shop, ready to wrap the guts throughout the season. 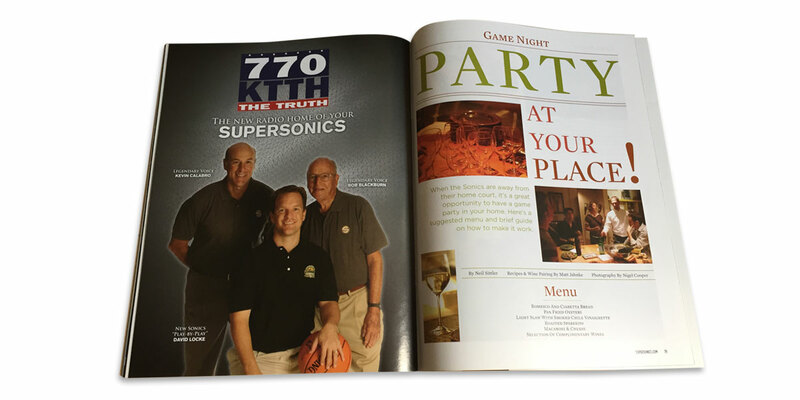 The publication was designed to be a variety magazine built around Sonics basketball. We wanted it to be taken home and shared rather than abandoned at the arena door on the way out. 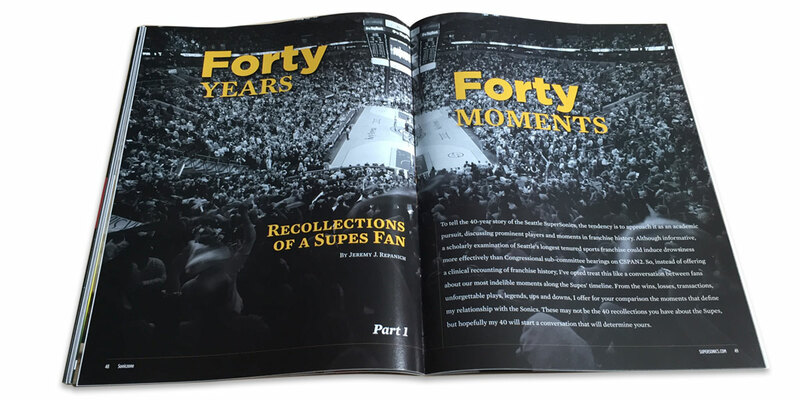 To this end, we included interviews with players, coaches and celebrity announcers, recipes for game day parties, and feature stories drawing from 40 years of team history. 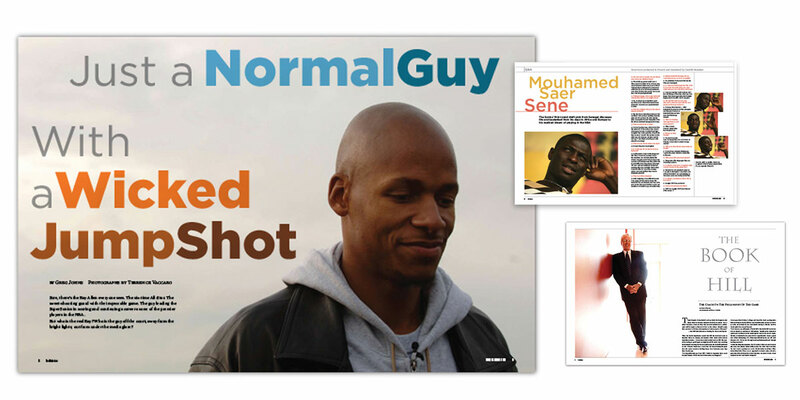 Custom photography and illustration made it a special publication. While taking stock of the resources available, I discovered a filing cabinet full of the team’s history in photos, stuffed in unmarked manila folders. 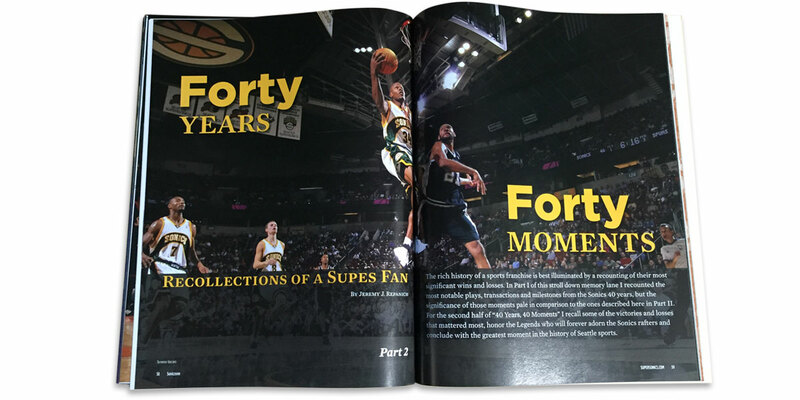 We used these along with the community’s collective memory to create 40 Years in 40 Moments, an article showcasing some of the team’s best moments. These photographs were also used in the various department sections of the magazine for nostalgic, and sometimes comic, effect. 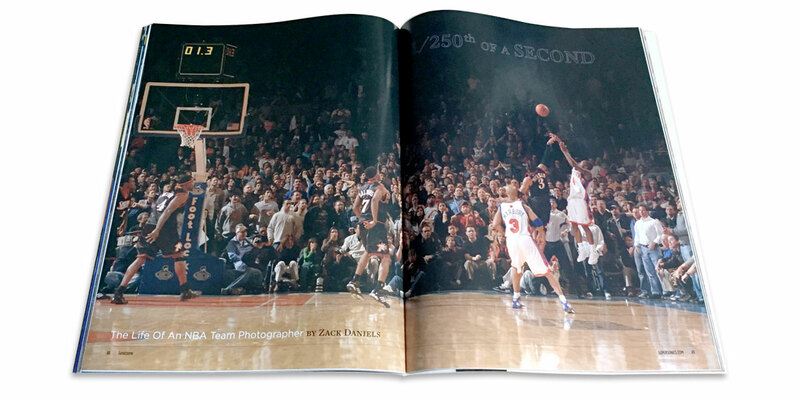 The NBA press recognized the project as unique and groundbreaking, and the executive team said the magazine was exactly what they wanted. The original plan was to build the magazine program over 5 years, assessing the ROI each year. We had one good year of publication before the team ownership changed and Seattle lost its beloved team to Oklahoma City. We were building a new model of elite advertising, but sadly we would not be able to see the plan through.